Today's Craft conversations is with Jane Gill. Jane was probably the first profesional paper crafter that I became friends with as we shared quite a few hours working together at a craft shop in Surrey (UK). I have tremendous admiration and love for Jane. 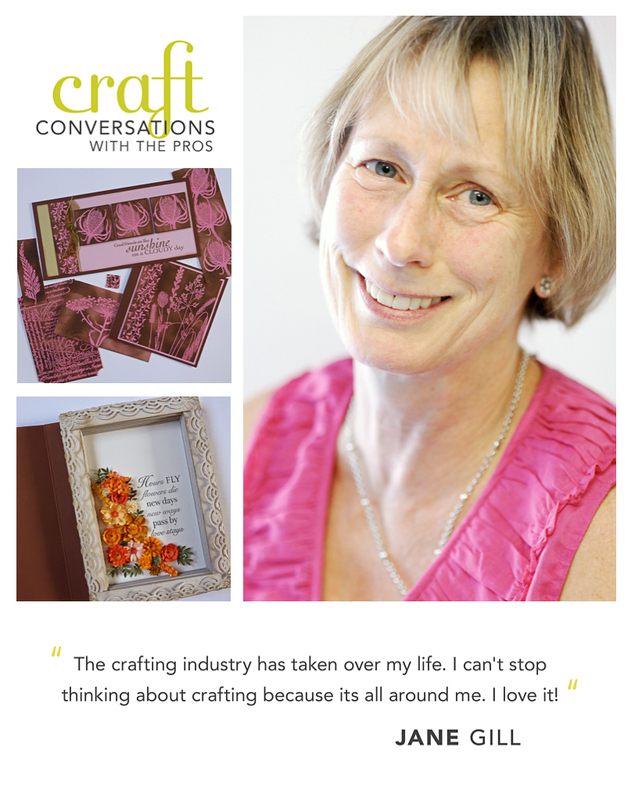 Jane, when and how did you start in the craft industry? I had taken botanical and natural history illustration at art college in the 1980s and had previously worked as a graphic designer in the publishing and printing industry for many years in Oxfordshire. I got married and moved away to live in West Sussex so had to give up my job. I came into the crafting world by chance. I had completed a decorative painting course in 1992 and was really into decorating and painting furniture and accessories for the home as a full time business. I wanted to promote my work and turned up at a local craft store (The Craft Barn) where I showed my pieces to the owner with a view to selling them. She really liked the accessories and wanted to know if I could teach others how to do the different painting affects. So I said yes! So I began a weekly class teaching people how to do paint effects, decoupage and stencilling. We made our own stencils and used rubber stamps and different painting techniques to decorate junk furniture. It was all the rage in the early 1990s! After several years fashions and trends changed and I caught the stamping bug while working in the craft store. I then began to teach stamping and card making classes instead of the decorative painting. Ten years ago I began to design my own stamps which are sold through Woodware a family run business in North Yorkshire. After 20 years in the industry I'm still teaching classes and demonstrating stamping techniques around the country and It's become a full time occupation. The crafting industry has taken over my life. You can't stop thinking about crafting because its all around you. I love it! My favourite thing is drawing new designs for stamps. Despite the pressures I love drawing and creating new stamps, I can use my art college training in illustration in a way I never thought about many years ago. It gives me such a buzz even now when I see one of my designs in a magazine having been used by someone else. I could quite easily sit at my desk in my craft room everyday drawing and working in Photoshop. But I also enjoy those special days out teaching and demonstrating at craft shops showing enthusiastic crafters my ideas for the latest stamps and how I like to use them. I love to meet fellow crafters and share ideas. Having my stamps on sale in the USA and seeing for them first time displayed by the distributor at a craft show in LA. Is it hard to work in the craft industry? Can you name your major challenges you face? Creating the images for stamps is hard work and takes a long time from initial thoughts and ideas to the sketches and drawings I do before transferring the images onto the computer where they are prepared for manufacture. There is a lot of pressure to come up with so many ideas and I work a year in advance, so I'm constantly looking around me for inspiration while reading magazines, shopping, on holiday or a day out with friends, anything can start an idea for the next stamp design. Once the stamps are created then it's the sample cards to be made. Coming up with new layouts is always a challenge. Trying to be different, unique but appeal to all ages and abilities. The craft industry these days is full of amazing up and coming talent who have great creative flair. One needs a mixture of creative talent, determination and the ability to keep up with the constant changes and trends we have in the crafting world today. What would you do differently in your craft career? I don't think I would do anything differently in my career but given the chance all over again, I wish I had started stamp designing much earlier than I did. Although I love to create cards, my favourite project would have to be something I can use as a picture. Whether it's on canvas or card, framed or unframed, I love wall art. Painting and adding texture, stamped images along with some drawing too. My inspiration is all around me sometimes. It could be the pattern on a friends dress or weeds growing by the railway line. I love to flick through interior magazines too and of course Pinterest. I hope I can keep up with changing trends in the craft industry and keep drawing new stamp ideas. My dream would be to have that idyllic converted barn at the bottom of my garden as my craft heaven. There I could hold classes and craft retreats for all the wonderful people I have met over the years, many have become great friends such as you Paula. We worked together at The Craft Barn back in 1994 if my memory serves me well. Your Spanish minimalist style is fantastic and you have such a way with colours! Everything you produce is beautiful, just like you. It was actually in the Autumm of 2003. In 1994 I was still in Spain in high school! But it does feel like I have known you forever! 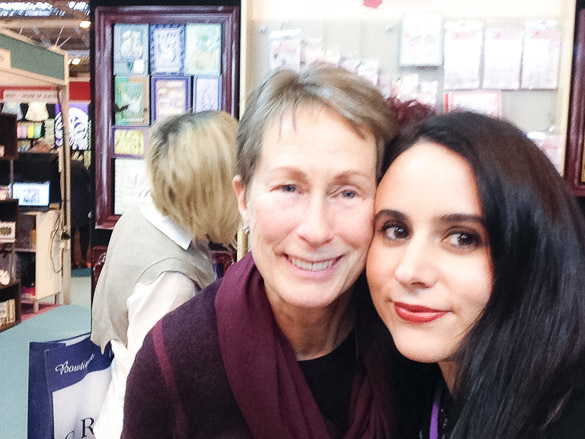 Jane has been always one of my favourite crafters, her style and personality (very ladylike!) are a joy!